There was a time, not that many decades ago, when being a woman with a university degree in Abbotsford was a rarity. Those who’d been lucky enough to have had a university education valued it highly, and sought the company of other educated women. Out of such a time came the Abbotsford chapter of the Canadian Federation of University Women, founded in 1953. Once a member joined, she tended to say for a long time. Arlene Kropp, for instance, recently celebrated 50 years with the club. The CFUW offers a forum for educated women of all ages to meet for fellowship, networking and involvement in the community. Programs on a variety of topics such as health, the environment, global issues and book discussions are a key component of monthly meetings. CFUW Abbotsford is committed to advancing the status of women and girls, human rights, justice and peace. In addition to their monthly meetings, the 59 members of the local group enjoy activities such as book clubs, bridge, cultural outings, golf, and hiking or walking. Another important mission of the CFUW is to support women in education, and the Abbotsford chapter has been a strong supporter of UFV students for many years. 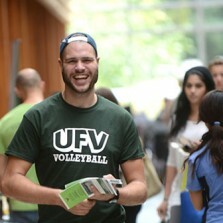 It started back when UFV formed as Fraser Valley College, with the Olive Kastner award for $500. The members fed the endowment through fundraisers such as garden tours, fashion shows, and dinners. Then, with “event fatigue” setting in, they decided to try an “un-fundraiser,” where members are asked to make a charitable contribution to the endowment fund. This typically takes place at their December meeting. They were recently able to add a new $1,500 annual bursary to their gifts to UFV. This year’s recipient of the bursary is a single mother studying kinesiology with a GPA of more than 4.0. She is very grateful for the support received. “As an older student, and single mother, I do not take for granted my ability to go to school and pursue this degree. Your financial support not only benefits my pursuit of education, but also takes a load off of my family. This is a difficult thing to do in our situation, and this financial support is not just an encouragement to keep going, it is a chance to breathe a bit easier and relieve some of the burden that adds to the pressures inherent in pursuing education at a later stage of life. “My path to education has not been an easy one, and each semester has its own struggles and challenges. Financially, I face this dream one semester at a time, never sure that I will be able to continue to the next. I feel deeply privileged to be able to pursue this degree, in hopes of having a career marked by knowledge, integrity, and purpose. “Each semester that I am able to continue, I am grateful for the opportunity. Your support of my efforts means a great deal, and allows me to continue pursuing something of great value to me. Resources are valuable, and that you would choose to share yours with me is an honour, and I am privileged by your generosity. My gratitude for this support runs deep, and I cannot express it sufficiently in words. I will use it as encouragement to keep working hard, and to pursue all that I do with excellence.